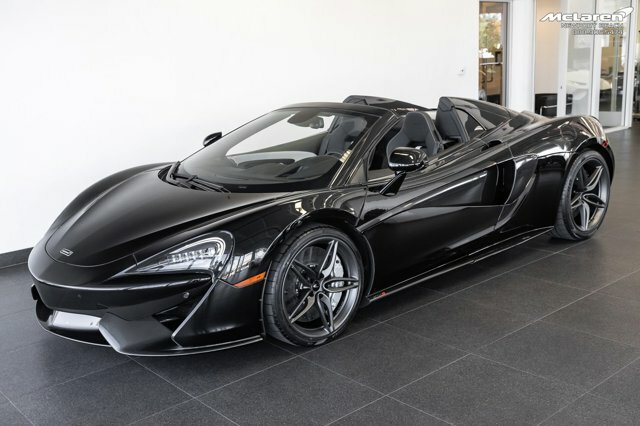 Mclaren Newport Beach is pleased to present for sale this stunning 2019 Mclaren 570S Spider as part of our hand-selected pre-owned lineup. This gorgeous example is finished in the metallic Onyx Black exterior paint, features the following options: 5 Twin-Spoke Lightweight Wheels in Stealth finish, Carbon Ceramic brakes with Silver calipers, Sports Exhaust, Carbon Black Leather interior with Almond White Leather accents, Contrast Almond White stitching, Almond White Leather inserts on Carbon Black leather seats, Navigation and Infotainment System, Bluetooth Connectivity, Carbon Black carpets, Carbon Black seatbelts, Electric and Heated Seats, Vehicle Lifting System, Parking Sensors Front and Rear, Rear View Back Up Camera, paddle-shifted twin-clutch Seamless-Shift gearbox, 562hp twin turbo 3.8L V8 engine, rear wheel drive, plus much more. We invite you to visit our world-renown showroom to see this stunning example in person. We invite you to contact us at your best convenience to learn more (888) 571-1959 / We look forward to speaking with you soon.